Barely have Microsoft’s Surface Pro 3 tablets started shipping, when the company has already launched a MacBook Air trade-in program. Customers who trade in select models of MacBook Air can get up to $650 in store credit that they can apply toward the purchase of a Surface Pro 3 at the Microsoft retail store. If the MacBook Air trade-in program is not a sign of Microsoft’s desperation, I don’t know what else it can be! To be eligible for the trade-in, the MacBook Air must power on, not be water-damaged or have a cracked screen. The trade-in program is valid until July 31, 2014. Microsoft has been pitching Surface Pro 3 as a laptop replacement and gone after Apple’s popular MacBook Air notebooks in advertisement and at the launch function in New York City last month. Surface Pro 3 tablets cost from $799 (64GB) to $1,949 (512GB) depending on size of storage and processor. Accessories such as the Surface Pro Type Cover keyboard ($130) and software like the Office Suite are extra. A 512GB version of Surface Pro 3 with keyboard, case, docking station, mouse and Office software costs over $2,500. Such a high price tag is sure to meet with strong resistance from buyers. Surface Pro 3 has a 12-inch screen and runs on Windows 8.1 Pro operating system software. Some models of Surface Pro 3 started shipping on June 20, 2014. Other configurations are scheduled to ship in August. Microsoft has struggled to win customers for its Surface line of tablets. The first two versions of Surface met with a tepid market response resulting in repeated price cuts and ultimately a write-off of nearly a billion dollars. Adding to Microsoft’s woes, the tablet market has slowed down in recent quarters. One Response to "Desperation – Microsoft Offers $650 Bribe"
It’s high time they start distributing Surface tablets for free through Melinda Gates Foundation. But I doubt there’ll be any takers for the Surface junk. There’s no chance in hell they’ll be able to sell the new Surface Pro 3 given the ridiculous price. If Surface Pro 3 is not to end up as landfill, then MSFT must resort to a fire-sale, like a $99 deal. 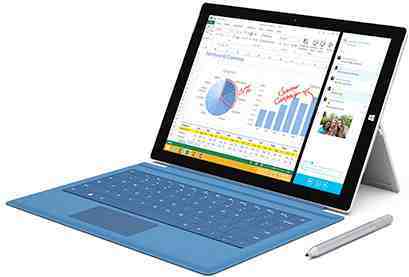 When the tablet market is slowing down, $2,500 for Surface Pro 3 tablet is beyond insanity!